To make these scones ahead of time, arrange scones on baking sheet, cover with plastic wrap, and freeze overnight. (Omit egg wash if freezing longer than 30 minutes.) Make marmalade 3 days ahead. Line a baking sheet with parchment paper. Lightly flour a work surface. For the scones, combine flour, granulated sugar, baking powder, and salt. Cut in butter with a pastry blender until pea-sized. Add pecans, cranberries, and 2 Tbsp. zest; toss to combine. Transfer dough to prepared work surface; shape into an 8-inch round with lightly floured hands. Cut dough into 8 wedges; transfer to prepared baking sheet, spacing at least 1-inch apart. Combine sanding sugar and 1 Tbsp. zest. Lightly brush tops of scones with egg wash; sprinkle with sugar-zest mixture. Freeze scones, uncovered, 30 minutes. Bake scones until golden and set, 20–25 minutes. Let scones cool briefly on baking sheet; serve warm or at room temperature. 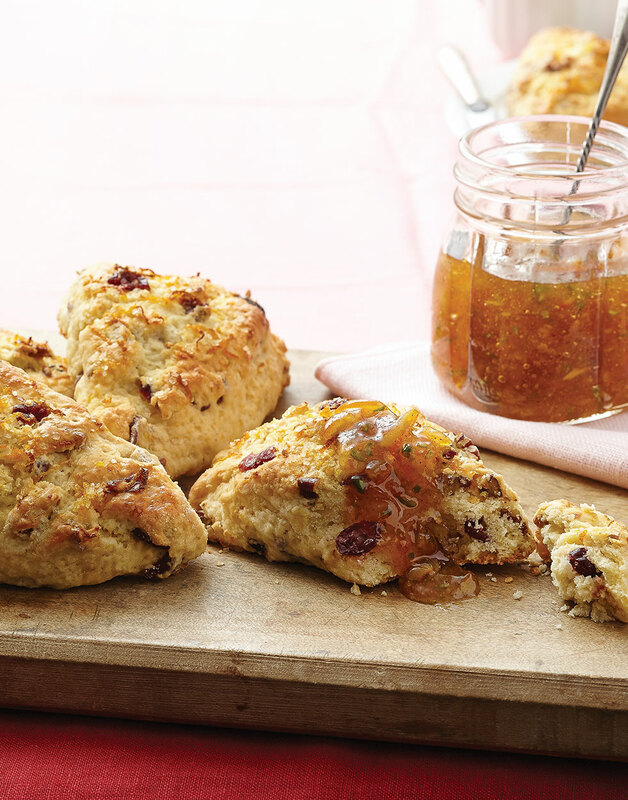 For the marmalade, combine marmalade, jalapeño, and cinnamon; serve with scones. For tender and flaky scones, a pastry blender cuts the butter into the flour without warming it. To keep the scones from becoming tough, use very little flour on your hands and work surface. For shiny scones, brush their tops with an egg wash. Space them apart so they rise evenly when baking.